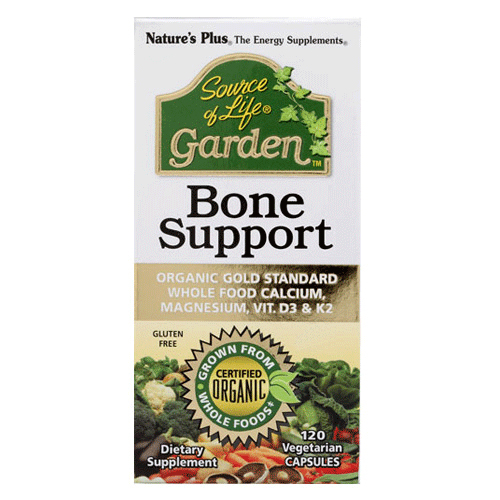 Nature`s Plus Source of Life Garden Bone Support with Organic Gold Standard Nutrients is the breakthrough all-organic source of whole-plant-source calcium and magnesium, plus vitamin D3 (cholecalciferol) and vitamin K2. Source of Life Garden Bone Support nutritionally supports healthy bones with 1000 mg of the most assimilable plant-based calcium from AlgaeCal. This marine algae is complete with over 73 trace elements and grows wild and untouched by modern agriculture. It is carefully and sustainably harvested live from the pristine shores of protected coastline in South America. Source of Life Garden Bone Support is then cold pressed to retain all of its naturally occurring nutritional value. For maximum absorption and utilization, Garden Bone Support provides 1000IU of vitamin D3. Its vitamin K2 (menaquinone-7) is the most bioavailable form of vitamin K, the critical bone-health nutrient. Certified Organic AlgaeCal calcium and magnesium. 100% Daily Value of Vitakin K (as vitamin K2) (m7). Organic Mushrooms supplying vitamin D3 and other healthful nutrients. Vitamin C (from certified organic amla berry [Emblica officinalis]), Vitamin D3 (from organic mushroom; cholecalciferol), Vitamin K2 (as menaquinone-7) (from certified organic natto), Calcium (from certified organic AlgaeCal), Magnesium (from certified organic AlgaeCal), Certified Organic AlgaeCa (Algas calcareas), - Supplying, Calcium, Magnesium, Certified Organic Mushroom Blend, Wood Ear Mushroom (Auricularia auricula), Cordyceps (Cordyceps sinensis), Maitake (Grifola frondosa), Shiitake (Lentinula edodes), Oyster Mushroom (Pleurotus ostreatus, P. nebrodensis, P. eryngii), White Wood Ear Mushroom (Tremella fuciformis), Certified Organic Amla Berry, (Emblica officinalis). Certified Organic Gold Standard Whole Food Blend [Organic Acerola Extract, Apple Fruit, Broccoli Sprout, Cauliflower Sprout, Collard, Cordyceps Mushroom Mycelia, Kale, Kale Sprout, Maitake Mushroom Mycelia (Grifola frondosa), Nettle, Parsley, Pure Beet Juice, Pure Carrot Juice, Pure Spirulina, Reishi Mushroom Mycelia, Shiitake Mushroom Mycelia, Spinach, Tomato Juice, Wild Bilberry, Wild Blueberry, Wild Lingonberry, Pure Chlorella], Organic Rice Maltodextrin, Mineral Fatty Acid Esters (Ca, Mg) from Safflower. Contains soy. As a dietary supplement, four vegicaps once daily. 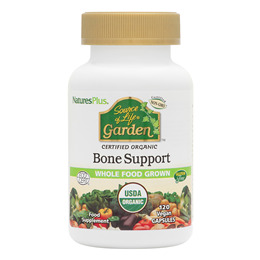 Below are reviews of Source of Life Garden Bone Support - 120 Vegicaps by bodykind customers. If you have tried this product we'd love to hear what you think so please leave a review. This is really excellent product, I bought it due to the comments left before me, I can't tell what it does to the bones, I am sure it works, what I can tell is as soon as I took it I felt lightness of my step, felt my muscles more elastic, I also noticed positive affect on the mind, very good all round. I bought this product for bone support (I am 54) but surprisingly it has helped with my muscles which have relaxed, I may have been short of calcium and magnesium as I work physically as a gardener. It is an excellent product.